Looking forward to the warmer and dryer weather book your Hog Roast BBQ now to make sure you get the date you want. We supply the hog complete with the spit and a chef! 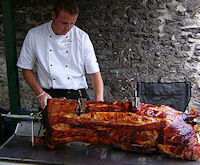 A Hog Roast comfortably feeds 120 guests - So call us now to arrange a hog roast for your special occasion. Circa £750, including rolls, sage and onion stuffing and apple sauce. Let us take all the hard work out of your BBQ. We cater to your exact needs - large or small. Enjoy our specialty bangers, burgers, butterfly legs of lamb, fillet steaks, fantastic salads, couscous and rice dishes. All prepared and delivered to your door, we'll even stay and cook it for you if you wish! 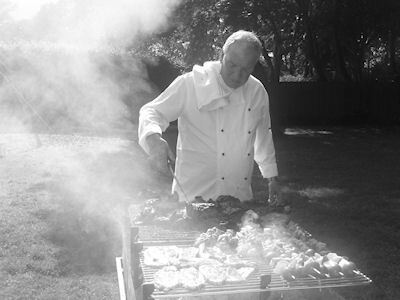 Call us now to arrange your perfect BBQ occasion and cooked on our own charcoal grills.